The LIFT (Leadership Input and Friendship Time) is basically a time where a few of relating churches in India get together and therefore this was a great time for me to meet many interesting people. During this time I had the opportunity to make new friends, find my way around Delhi, enjoy Indian cuisine and sights and have my passport stolen. The last one on the list wasn’t fun at the time, but turned out being an adventure in itself. I got to experience a police station in Delhi and I met the South African consular, who else can say that! I have many memorable and interesting times during this week, like the Taj Mahal, Agra fort and my visit to a hospital, but it’s too much to write them all down here. In any case this first week was a crucial time for me to find my feet. I also met Olga in Delhi from whom I bought the bike. She has blog (183daysinindia.blogspot.com). I encourage you to read it, since she was in India for six month travelling on a bike, on her own! Impressive! This was a part of my trip I was most excited about. 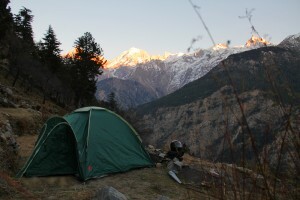 Imagine riding and camping in the middle of the Himalayas. Well, that’s what I did and the experience was phenomenal. But first I had to collect the bike in Mumbai (Bombay), requiring a total of 51 hours on the train there and back as well as the politics and stress involved in getting the bike on the train and not to mention off the train and out of the station. But with a bit of effort and not too many problems I was riding for my first time in Delhi at 11 o’clock at night and I had absolutely no idea where I was going and I had no map either. Not great planning from my part, but of course there are always people to ask, so after 2 hours of travelling around Delhi, having a lots of fun enjoying the fairly empty roads, and a quick bite to eat at McDonalds, I managed to find my accommodation by 1am in the morning. 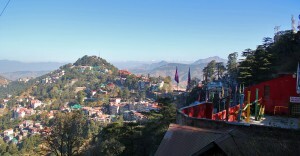 Two days later I was off to Shimla after prepping and Travelled for my first full day motorbike ride. 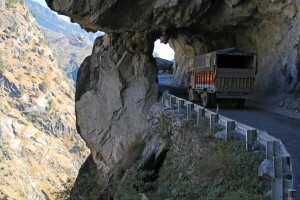 The road up to Shimla is incredible! It winds along the hilltops of the Himalayas and not only is it beautiful, but also really enjoyable riding. But unfortunately due to my long ride I got sick the first night and so I got to spend 2 days in Shimla instead of 1 day only. My ultimate goal was to get to Leh (far north), but due to it being winter I was told by some tour guides that the 2 passes to ride over were closed. In retrospect I should never have listened to the tour guides, because at the very least Rothung pass was definitely open. 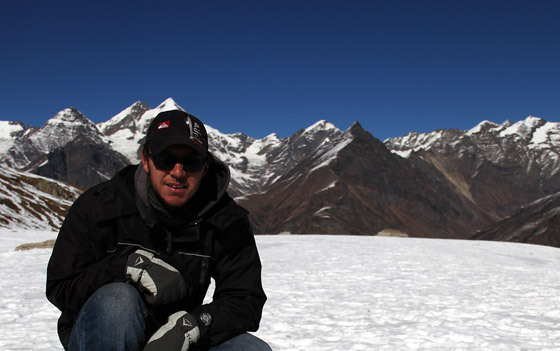 But I made my choice and I aimed to go through Spiti Valley by going through Recong Peo. So I left Shimla stopped over for the night at a fairly dodgy hotel in Rampur and then next day didn’t get very far before I was delayed by a landslide on the road. So I lost another day and then arrived at Recong Peo the following day. At Recong Peo I couldn’t get a permit to continue so I had to camp the night at a small place just above Recong Peo called Kalpa. So overlooking three 6000m high peaks, I setup my tent and made a fire. What an experience!! I’ve attached picture of my campsite. So the next day I hoped to get a permit, but apparently I’m not allowed to go through alone and there was no group coming through which I could join, so I decided to scrap that idea and I started heading for Manali. Again I was delayed due to a collapsed bridge so only the following day I reacedh Manali, but at least I had time to spare. On my way to Manali I travelled over Jarori pass which was where I saw my first snow and then down through Shoja, which is a most enchanting village. In Manali I learnt that Rothung pass was open and was quite disappointed since if I had travelled that direction from the beginning, I may have gotten a lot further. In any case I stayed 2 days in Manali and on the second day I decided to go up Rothung pass. The only problem was the bike’s kickstart didn’t work on that morning, but I decided to continue in any case, push starting the bike, since in the mountains there’s always a downhill. The pass was very tough riding and I fell on the bike when I encountered some ice! I wasn’t hurt, but it was quite a fall and a shock to my system, warning me to be careful. So the ride up was quite challenging itself, but the site and the value of reaching the summit was enthralling and absolutely worth it! The next day I started back to Delhi and arrived there 2 days later. I believe the bike trip really built my character and being on my own made me realize how comfortable and easy life is here in our beautiful city of Hermanus, so I learnt much and can’t wait to go back for another Himalayan adventure. Next trip I plan to meet many churches up there and make many new friends. And of course reach the town of Leh! 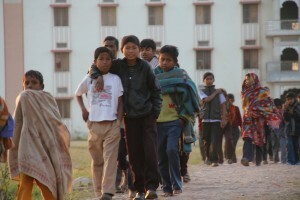 After a couple days recovery in Delhi, I left on the bike south to Kota to join Global Challenge at an orphanage. I travelled 470kms that day from 6am to 8pm and boy was it a long ride. I took the wrong turn and ended up going on all the country roads, which have massive pothills/craters and seemingly someone didn’t think they were bad enough so they decided to put camouflaged speed bumps in the most arb areas. I’ll never complain about South African speed bumps again! But I did reach my destination, even though I had to use the headtorch at night since the bike’s headlight was out. Fortunately in India, road rules are the pirate code. They’re more like guidelines and even a cop laughed at me when he saw this foreigner with a tiny headlamp hoping to survive the ride. In Kota I helped paint a church and got to preach in that same church which was an honour. The orphans and there stories were incredible too and that in itself was an unforgettable experience, with certainly a different flavour from the lonely bike trip north! But as the time at the orphanage came to a close so did my time in India for 2010 and after sorting out my passport and exit visa I arrived back in Hermanus on Christmas eve, with many golden memories. Thanks for reading this post. As a Christian, there were many things which stirred my heart and I believe changed false perceptions in my life, calling me to more, and so I wish to say thank you to God for making this trip possible. Wow, it sounds like an amazing experience! Do you plan to return there every year? Yip, 95% sure I’ll be going in October again and then I’m hoping to somehow setup some business relations so that next year I can go for 3 months and still continue work. WOW! What a tremendous experience (and joy ride). May God’s blessing and goodness and favour rest upon you Stevo, my brother!